On Thursday, October 25, 2018, Joseph T. Lovoy, loving husband, father, grandfather, brother and uncle, passed away after a short illness. He was 86. Joe is survived by his wife Lynne Lovoy, to whom he was married for 54 years. Joe is also survived by his five children: Steve Lovoy, Ken Lovoy, Thomas Lovoy, Amy Lovoy, and Jon Lovoy, as well as his sisters Mary Frances Bruce and Lucy Bartlett. He was preceded in death by his brother Thomas Lovoy and his parents Brace and Mary Lovoy. Joe was born in Birmingham and graduated from the University of Alabama where he was a proud member of the University of Alabama Million Dollar Band. He was a life-long Alabama fan and was active in the Alabama booster organization in Pensacola. After college, Joe served in the United States Air Force before moving to Birmingham to work for the Social Security Administration, where he met his wife, Lynne. In 1964, they moved to Pensacola where he built and ran a successful financial advisory practice for 38 years. Joe supported many great organizations. 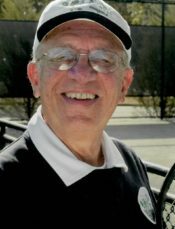 He was active in the Pensacola tennis scene and was a long-time organizer and promoter of the Under the Hill Tennis League and the Roger Scott Tennis Center. Joe served on the board of the WSRE-TV Foundation, and he was active in the River Garden’s Neighborhood Association. A memorial and celebration of Joe’s life will be held at Saint Luke’s United Methodist Church, 1394 E. Nine Mile Road, Pensacola, on Tuesday, October 30, 2018, at 2:00 PM. The memorial will be officiated by Larry Anderson and Don Abrams. A visitation and reception will follow at 3:00. In lieu of flowers, a donation can be made to WSRE-TV, or Saint Luke’s United Methodist Church. Amy , I am so sorry to hear about your dad. He was a sweetie. Loved seeing him at church. My prayers are with you and your family.